Product #2136 | SKU 8260APM | 0.0 (no ratings yet) Thanks for your rating! 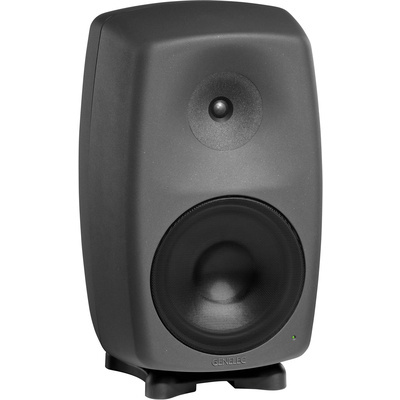 The 8260A from Genelec is an advanced 3-way monitor speaker ideal for use in professional studios. The speaker has a die-cast aluminium Minimum Diffraction Enclosure that houses a 254 mm woofer, a 127 mm midrange driver, and a 19 mm tweeter. The coaxial driver design provides accurate imaging and excellent sound quality. A Directivity Control Waveguide ensures that the drivers couple properly over their full bandwidth and create an accurate mid/high point source. The tri-amplified design provides 390W of total output power for a strong, clear performance with exceptionally low distortion. The speaker features DSP signal processing, which is responsible for all of the speaker functions such as crossover, driver AEQ, room response alignment, and more. Genelec Loudspeaker Manager software (sold separately) allows you to manage all of the functions easily. The speaker has both analogue and digital inputs, plus a digital through connector for terrific flexibility. An Iso-Pod base decouples the speaker from its mounting surface to eliminate colouration caused by vibrations and reflections.